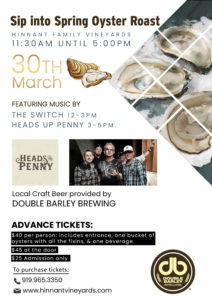 What better way to welcome Spring than with Oysters, local wine & craft beer, live music, & great company!? NC favorites, The Switch will kick off our live music at 12pm & Heads Up Penny will finish out the day from 3-5pm. Enjoy North Carolina Oysters, local craft beer from Double Barley, & Hinnant wines. Sit back, relax, & enjoy the sites and sounds on our beautiful back patio over looking 100 acres of vineyards. *Advance Tickets are recommend. This event will sell out. Extra buckets of oysters will be available for purchase the day of the event. Tickets can be purchased by calling 919.965.3350 at this time. They will be available on line soon. *No coolers, outside alcohol, or outside food/beverages allowed. Bring your own lawn chair. Event is rain or shine. We have indoor space in the event of bad weather. Children are welcome, but they must be supervised at all times.